The different measurements in social science research require quantification of abstracts, intangible and construct that may not be observable. However, these quantification will come in the different forms of inference. In addition, the inferences made will depend on the type of measurement. These can be observational, self-report, interview and record review. The various measurements will ultimately require measurement tools through which the values will be captured. One of the most common tasks often encountered in social science research is ascertaining the validity and reliability of a measurement tool. The researchers always wish to know if the measurement tool employed actually measures the intended research concept or construct (is it valid? or true measures?) or if the measurement tools used to quantify the variables provide stable or consistent responses (is it reliable? or repeatable?). As simple as this may seems, it is often omitted or just mentioned passively in the research proposal or report. This has been adduced to the dearth of skills and knowledge of validity and reliability test analysis among social and health science researchers. From the author's personal observation among researchers in developing countries, most students and young researchers are not able to distinguish validity from reliability. Likewise, they do not have the prerequisite to understand the principles that underline validity and reliability testing of a research measurement tool. This article therefore sets out to review the principles and methods of validity and reliability measurement tools used in social and health science researches. To achieve the stated goal, the author reviewed currents articles (both print and online), scientific textbooks, lecture notes/presentations and health programme papers. This is with a view to critically review current principles and methods of reliability and validity tests as they are applicable to questionnaire use in social and health researches. A drafted questionnaire should always be ready for establishing validity. Validity is the amount of systematic or built-in error in questionnaire. , Validity of a questionnaire can be established using a panel of experts which explore theoretical construct as shown in [Figure 2]. This form of validity exploits how well the idea of a theoretical construct is represented in an operational measure (questionnaire). This is called a translational or representational validity. Two subtypes of validity belongs to this form namely; face validity and content validity. On the other hand, questionnaire validity can be established with the use of another survey in the form of a field test and this examines how well a given measure relates to one or more external criterion, based on empirical constructs as shown in [Figure 2]. These forms could be criterion-related validity , and construct validity. While some authors believe that criterion-related validity encompasses construct validity,  others believe both are separate entities. According to the authors who put the 2 as separate entities, predictive validity and concurrence validity are subtypes of criterion-related validity while convergence validity, discriminant validity, known-group validity and factorial validity are sub-types of construct validity [Figure 2]. In addition, some authors included hypothesis-testing validity as a form of construct validity. The detailed description of the subtypes are described in the next paragraphs. This assesses the newly developed questionnaire against a highly rated existing standard (gold standard). When the criterion exists at the same time as the measure, we talk about concurrent validity. ,,, Concurrent validity refers to the ability of a test to predict an event in the present form. For instance, in a simplest form, a researcher may use questionnaire to elucidate diabetic patients' blood sugar level reading in the last hospital follow-up visits and compare this response to laboratory reading of blood glucose for such patient. There is evidence that the same concept measured in different ways yields similar results. In this case, one could include two different tests. In convergent validity where different measures of the same concept yield similar results, a researcher uses self-report versus observation (different measures). ,,,, The 2 scenarios given below illustrate this concept. A researcher could place meters on respondent's television (TV) sets to record the time that people spend with certain health programmes on TV. Then, this record can be compared with survey results on 'exposure to health program on televised' using questionnaire. The researcher could send someone to observe respondent's TV use at their home and compare the observation results with the survey results using questionnaire. There is evidence that one concept is different from other closely related concepts. ,, Using the scenarios of TV health programme exposure above, the researcher can decide to measure the exposure to TV entertainment programmes and determine if they differ from TV health programme exposure measures. In this case, the measures of exposure to TV health programme should not be highly related to the measures of exposure to TV entertainment programmes. In known-group validity, a group with already established attribute of the outcome of construct is compared with a group in whom the attribute is not yet established. , Since the attribute of the two groups of respondents is known, it is expected that the measured construct will be higher in the group with related attribute but lower in the group with unrelated attribute. ,,, For example, in a survey that used questionnaire to explore depression among two groups of patients with clinical diagnosis of depression and those without. It is expected (in known-group validity) that the construct of depression in the questionnaire will be scored higher among the patients with clinically diagnosed depression than those without the diagnosis. Another example was shown in a study by Singh et al. where cognitive interview study was conducted among school pupils in 6 European countries. Evidence that a research hypothesis about the relationship between the measured concept (variable) or other concepts (variables), derived from a theory, is supported. , In the case of TV viewing, for example, there is a social learning theory stating how violent behaviour can be learned from observing and modelling televised physical violence. From this theory, we could derive a hypothesis stating a positive correlation between physical aggression and the amount of televised physical violence viewing. If the evidence collected supports the hypothesis, we can conclude that there is a high degree of construct validity in the measurements of physical aggression and viewing of televised physical violence since the two theoretical concepts are measured and examined in the hypothesis-testing process. Reliability is an extent to which a questionnaire, test, observation or any measurement procedure produces the same results on repeated trials. In short, it is the stability or consistency of scores over time or across raters. Keep in mind that reliability pertains to scores not people. Thus, in research, one would never say that someone was reliable. As an example, consider judges in a platform diving competition. The extent to which they agree on the scores for each contestant is an indication of reliability. Similarly, the degree to which an individual's responses (i.e., their scores) on a survey would stay the same over time is also a sign of reliability. It is worthy to note that lack of reliability may arise from divergences between observers or instruments of measurement or instability of the attribute being measured. Reliability of the questionnaire is usually carried out using a pilot test. Reliability could be assessed in three major forms; test-retest reliability, alternate-form reliability and internal consistency reliability. These are discussed below. Test-retest correlation provides an indication of stability over time. ,,, This aspect of reliability or stability is said to occur when the same or similar scores are obtained with repeated testing with the same group of respondents. ,,, In other words, the scores are consistent from 1 time to the next. Stability is assessed through a test-retest procedure that involves administering the same measurement instrument such as questionnaire to the same individuals under the same conditions after some period of time. It is the most common form in surveys for reliability test of questionnaire. The second assumption is that the time period is long enough yet short in time that the respondents' memories of taking the test at time 1 do not influence their scores at time 2 and subsequent test administrations called 'memory effect'. No of agreements/no of opportunities for agreement ×100. Thus, in a situation in which raters agree in a total of 75 times out of 90 opportunities (i.e. unique observations or ratings) produces 83% agreement that is 75/90 = 0.83 × 100 = 83%. KR-20 = n/(n − 1)[1 − Sum(piqi)/Var(X)]. a = n/(n − 1)[1 − Sum Var (Yi)/Var (X)]. It should be noted that KR-20 and Cronbach alpha can easily be estimated using several statistical analysis software these days. Therefore, researchers do not have to go through the laborious exercise of memorising the mathematical formula given above. As a rule of thumb, the higher the reliability value, the more reliable the measure. The general convention in research has been prescribed by Nunnally and Bernstein,  which states that one should strive for reliability values of 0.70 or higher. It is worthy of note that reliability values increase as test length increases. That is, the more items we have in our scale to measure the construct of interest, the more reliable our scale will become. However, the problem with simply increasing the number of scale items when performing applied research is that respondents are less likely to participate and answer completely when confronted with the prospect of replying to a lengthy questionnaire. Therefore, the best approach is to develop a scale that completely measures the construct of interest and yet does so in as parsimonious or economical manner as is possible. A well-developed yet brief scale may lead to higher levels of respondent participation and comprehensiveness of responses so that one acquires a rich pool of data with which to answer the research question. Items with 0, 1 and negative scores: Ensure that items/statements that have 0 s, 1 s and negatives are eliminated. The detailed step by step procedure for the reliability analysis using SPSS can be found on internet and standard tests. , But, note that the reliability coefficient (alpha) can range from 0 to 1, with 0 representing a questionnaire that is not reliable and 1 representing absolutely reliable questionnaire. A reliability coefficient (alpha) of 0.70 or higher is considered acceptable reliability in SPSS. This article reviewed validity and reliability of questionnaire as an important research tool in social and health science research. The article observed the importance of validity and reliability tests in research and gave both literary and technical meanings of these tests. Various forms and methods of analysing validity and reliability of questionnaire were discussed with the main aim of improving the skills and knowledge of these tests among researchers in developing countries. Miller VA, Reynolds WW, Ittenbach RF, Luce MF, Beauchamp TL, Nelson RM. Challenges in measuring a new construct: Perception of voluntariness for research and treatment decision making. J Empir Res Hum Res Ethics 2009;4:21-31. Kember D, Leung DY. Establishing the validity and reliability of course evaluation questionnaires. Assess Eval High Educ 2008;33:341-53. Last JM. A Dictionary of Epidemiology. 4 th ed. New York: Oxford University Press; 2001. Available from: . [Last accessed on 2015 Oct 10]. Rothman KJ, Greenland S, Lash TL. Modern Epidemiology. Philadelphia, USA: Lippincott William and Wilkins; 2008. p. 128-47. Wong KL, Ong SF, Kuek TY. Constructing a survey questionnaire to collect data on service quality of business academics. Eur J Soc Sci 2012;29:209-21.
Cooper DR, Schindler PS. Business Research Methods. 9 th ed. New York: McGraw-Hill; 2006. Miller MJ. Graduate Research Methods. Available from: . [Last accessed on 2015 Oct 10]. Varkevisser CM, Pathmanathan I, Brownlee A. Proposal development and fieldwork. Designing and Conducting Health Research Projects. Vol. I. Ottawa, Canada, Amsterdam: KIT Publishers, IDRC; 2003. p. 137-41. Norland-Tilburg EV. Controlling error in evaluation instruments. J Ext (Online) 1990;28. Available from: . [Last accessed on 2015 Oct 10]. Bhattacherjee A. Social Science Research: Principles, Methods, and Practices. 2 nd ed. Open Access Textbooks; 2012. Available from: . [Last accessed on 2015 Oct 10]. Engel RJ, Schutt RK. Measurement. The Practice of Research in Social Work. 3 rd ed., Ch. 4. Sage Publication Inc. (Online); 2013. p. 97-104. Available from: https://www.us.sagepub.com/sites/default/files/upm-binaries/45955_chapter_4.pdf. [Last accessed on 2015 Oct 10]. Wells CS. Reliability and Validity; 2003. Available from: . [Last accessed on 2015 Dec 09]. Cook DA, Beckman TJ. Current concepts in validity and reliability for psychometric instruments: Theory and application. Am J Med 2006;119:166.e7-16. Sangoseni O, Hellman M, Hill C. Development and validation of a questionnaire to assess the effect of online learning on behaviors, attitude and clinical practices of physical therapists in United States regarding of evidence-based practice. Internet J Allied Health Sci Pract 2013;11:1-12. DeVon HA, Block ME, Moyle-Wright P, Ernst DM, Hayden SJ, Lazzara DJ, et al. A psychometric toolbox for testing validity and reliability. J Nurs Scholarsh 2007;39:155-64. Davis LL. Instrument review: Getting the most from a panel of experts. Applied Nurs Res 1992;5:194-7. Grant JS, Davis LL. Selection and use of content experts for instrument development. Res Nurs Health 1997;20:269-74. Haynes S, Richard D Kubany E. Content validity in psychological assessment: A functional approach to concepts and methods. Psychol Assess 1995;7:238-47. Anderson AS, Bell A, Adamson A, Moynihan P. A questionnaire assessment of nutrition knowledge - Validity and reliability issues. Public Health Nutr 2002;5:497-503. Mackison D, Wrieden WL, Anderson AS. Validity and reliability testing of a short questionnaire developed to assess consumers′ use, understanding and perception of food labels. Eur J Clin Nutr 2010;64:210-7. Drost EA. 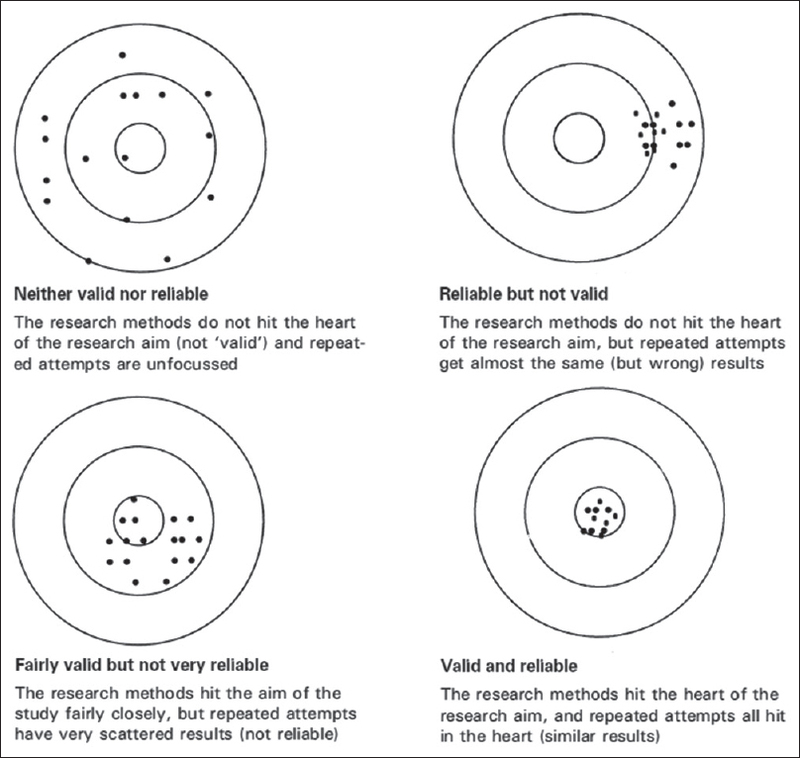 Validity and reliability in social science research. Educ Res Perspect 2011;38:105-23. Liang Y, Laua PW, Huang YW, Maddison R, Baranowski T. Validity and reliability of questionnaires measuring physical activity self-efficacy, enjoyment, social support among Hong Kong Chinese children. Prev Med Rep 2014;1:48-52. Booth ML, Okely AD, Chey TN, Bauman A. The reliability and validity of the adolescent physical activity recall questionnaire. Med Sci Sports Exerc 2002;34:1986-95. Pedisic Z, Bennie JA, Timperio AF, Crawford DA, Dunstan DW, Bauman AE, et al. Workplace sitting breaks questionnaire (SITBRQ): An assessment of concurrent validity and test-retest reliability. BMC Public Health 2014;14:1249. Polikandrioti M, Goudevenos I, Michalis L, Nikolaou V, Dilanas C, Olympios C, et al. Validation and reliability analysis of the questionnaire "Needs of hospitalized patients with coronary artery disease". Health Sci J 2011;5:137-48. Strauss ME, Smith GT. 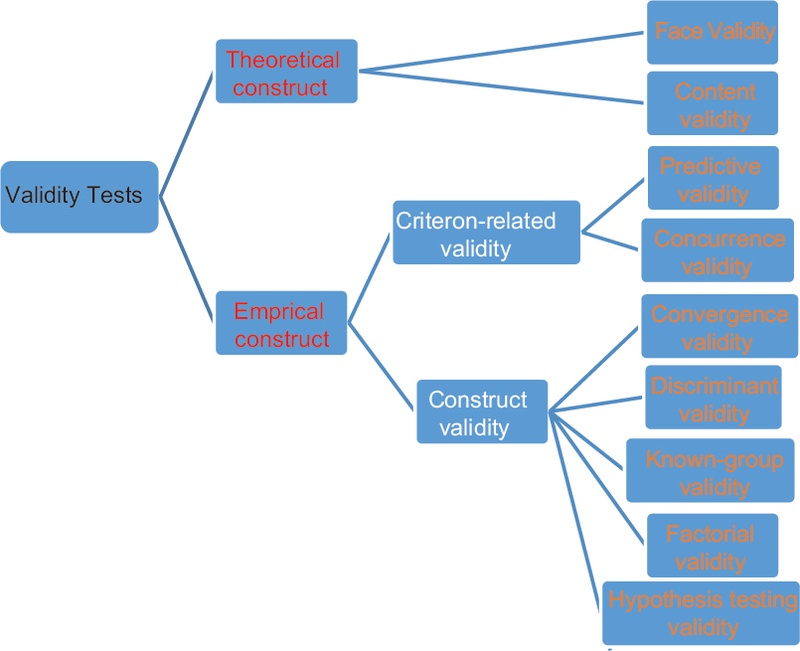 Construct validity: Advances in theory and methodology. Annu Rev Clin Psychol 2009;5:1-25. Colliver JA, Conlee MJ, Verhulst SJ. From test validity to construct validity … and back? Med Educ 2012;46:366-71. Smith GT. On construct validity: Issues of method and measurement. Psychol Assess 2005;17:396-408. Schimmack U. What multi-method data tell us about construct validity. Eur J Pers 2010;24:241-57. Anderson JL, Sellbom M. Construct validity of the DSM-5 section III personality trait profile for borderline personality disorder. J Pers Assess 2015;97:478-86. Erdvik IB, Øverby NC, Haugen T. Translating, reliability testing, and validating a norwegian questionnaire to assess adolescents′ intentions to be physically active after high school graduation. Sage Open 2015;5:1-6. DeVellis RF. Scale Development: Theory and Applications. 3 rd ed. Thousand Oaks, California: SAGE; 2012. Deniz MS, Alsaffar AA. Assessing the validity and reliability of a questionnaire on dietary fibre-related knowledge in a Turkish student population. J Heath Popul Nutr 2013;31:497-503. Singh AS, Vik FN, Chinapaw MJ, Uijtdewilligen L, Verloigne M, Fernández-Alvira JM, et al. Test-retest reliability and construct validity of the ENERGY-child questionnaire on energy balance-related behaviours and their potential determinants: The ENERGY-project. Int J Behav Nutr Phys Act 2011;8:136. Douglas H, Bore M, Munro D. Construct validity of a two-factor model of psychopathy. Psychology 2012;3:243-8. Motl RW, Dishman RK, Trost SG, Saunders RP, Dowda M, Felton G, et al. Factorial validity and invariance of questionnaires measuring social-cognitive determinants of physical activity among adolescent girls. Prev Med 2000;31:584-94. Dhillon HK, Zaini MZ, Quek KF, Singh HJ, Kaur G, Rusli BN. Exploratory and confirmatory factor analyses for testing validity and reliability of the malay language questionnaire for urinary incontinence diagnosis (QUID). Open J Prev Med 2014;4:844-51. Anastasiadou SD. Reliabilty and validity testing of a new scale for measuring attitudes and toward learning statistics with technology. Acta Didactica Napocensia 2011;4:1-10. Maruish ME, editor. User′s Manual for the SF-36v2 Health Survey. 3 rd ed. Lincoln, RI: Quality Metric Incorporated; 2011. Parsian N, Dunning T. Developing and validating a questionnaire to measure spirituality: A psychometric process. Glob J Health Sci 2009;1:1-10. Litwin, M. How to Measure Survey Reliability and Validity. Thousand Oaks, CA: Sage Publications; 1995. Tavakol M, Dennick R. Making sense of Cronbach′s alpha. Int J Med Educ 2011;2:53-5. Shaik MM, Hassan NB, Tan HL, Bhaskar S, Gan SH. Validity and reliability of the Bahasa Melayu version of the migraine disability assessment questionnaire. Biomed Res Int 2014;2014:435856. Parry KW, Proctor-Thomson SB. Testing the validity and reliability of the organizational descriptive questionnaire (ODQ). Int J Organ Behav 2007;4:111-24. Kuder GF, Richardson MW. The theory of the estimation of test reliability. Psychometrika 1937;2:151-60. Allen MJ, Yen WM. Introduction to Measurement Theory. Monterey, CA: Brooks/Cole; 1979. Nunnally JC, Bernstein IH. Psychometric Theory. 3 rd ed. New York: McGraw-Hill; 1994. Gulliksen HO. Theory of Mental Tests. New York: John Wiley and Sons, Inc.; 1950. Oluwadiya K. Getting to Know SPSS; 2013. Available from: . [Last accessed on 2013 Oct 20]. George D, Mallery P. IBM SPSS Statistics 21 Step by Step: Instructor′s Manual. Available from: . [Last accessed on 2015 Dec 19].